Thrill someone special with an experience that they will never forget. 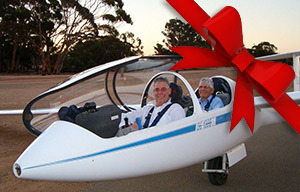 This gift card can be used to book an Air Experience Flights in a glider at the Beverley Soaring Society's airstrip located near Beverley, Western Australia. Air Experience Flights are available most weeks on Friday, Saturday & Sunday and the card is valid for up to a year after purchase. The lucky recipient can choose to sit back, take photos and enjoy the ride or take the controls yourself under the guidance of an experienced pilot or both! We provide you with a link where you can download a gift card file to print and personalise on your own color printer or you can optionally order a printed card to be mailed out to you. Gliding, like many outdoor sports, is weather dependent. If the weather forcast is not favourable for the day that is finally booked, then we will contact the person to arrange another time.